Too much history, and not enough fiction, mars this continuation of the Stapleton family saga (after Remember the Morning) from 1827 to 1861. The three main characters--George Stapleton, Hudson Valley land-heir and politician; Caroline Kemple Stapleton, the woman he marries, whose indomitable desire for fame and power becomes her spiritual and moral undoing; and John Sladen, George's friend, who becomes Caroline's lover and partner in crime--interact with a veritable who's who of presidents, politicians, generals and women whose fame and influence emanate from their husbands' roles as statesmen and leaders. 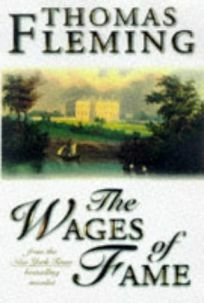 Fleming appeals to female readers with his contention that the women behind the prominent men in politics were the primary forces who shaped our history. Unfortunately, the historian who chronicles significant events, important battles and internecine controversies (of which there are an abundance) overshadows the novelist who might have written another formidable Stapleton family epic. $100,000 ad/promo. (Sept.) FYI: Remember the Morning will be published simultaneously in mass market.